Simeon Taylor Walton, born March 2, 1829, was the son of Rev. William M. Walton and Mary William Wootton of Osceola Plantation, Prince Edward Co., VA. After beginning his formal education in medicine near home under Dr. John Peter Mattauer of Hampden Sydney, VA, Simeon graduated in 1849 from Jefferson [Medical] College, Philadelphia, PA with an M.D. He practiced at Sandy River Church in Prince Edward Co. before moving to Keysville, VA in 1855. Virginia seceded from the Union on 17 April 1861, and joined the Confederacy. Simeon had already enlisted in the “Keysville Guards” and by July 1861 was promoted to Captain with a strong belief in the “Right and Holiness of the Southern Cause” (A.S. Priddy, 1910). 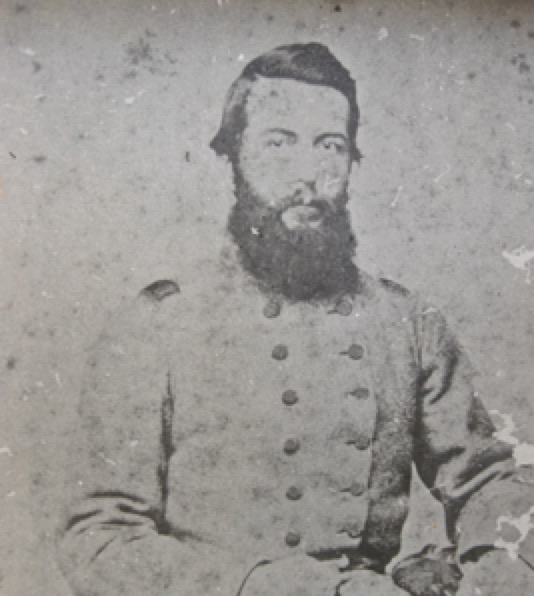 Because of the great need for surgeons in the Confederate Army hospitals, Dr. Walton was urged to transfer to that branch of service but declined expressing a preference for service in the field. Simeon was wounded in battle at Winchester, VA. He saw action during the Antinetam Campaign at Sharpsburg, MD where he was wounded again. He was wounded again in January 1863 near Snicker’s Neck, between Winchester and Leesburg, VA. By August 1862, at age 33, he was promoted to Lt. Colonel. Simeon was in the Battle of Chancellorsville in Spotsylvania, Co., VA where “Stonewall” Jackson was killed by friendly fire on 9 May 1863. 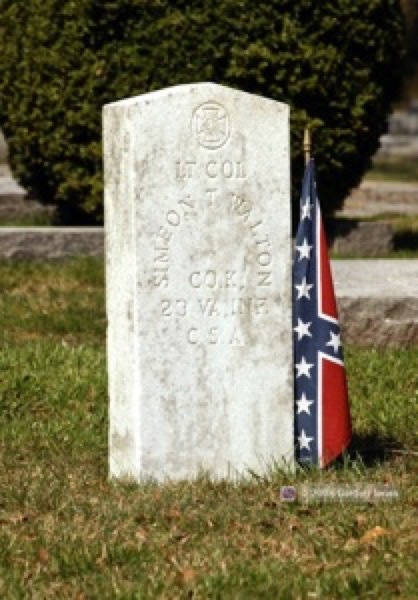 Although it was a Confederate victory, there were many casualties and Simeon was very sick, having been on the field of battle against doctor’s orders. By 26 May, Simeon was ordered by Gen. Robert E. Lee to lead the 23rd Regiment in picking up arms from the battlefield at Chancellorsville. Just two months later, he saw action again with the 23rd in the Battle of Gettysburg, where more men fought and died than in any battle in U.S. history. Simeon Taylor Walton was reported killed on 27 Nov 1863 in the Battle of Payne’s Farm, Mine Run Campaign, in Orange Co., VA. Mine Run lies due west of Fredericksburg and southwest of Wilderness. The soldiers reported that when Simeon’s body was brought back to camp, a promotion to Brigadier General was waiting for him. He was buried in Westview Cemetery on Route 15 south of Farmsville, VA, and his grave is marked by a typical white marble stone inscribed with name, rank, company and “CSA”. Additional information on the Simeon T. Walton family history is found in Issue 88 of the BFA newsletter and additional family pictures can be found in the picture albums section.